The more dangerously you slide, the bigger the reward! Slide turbo-speed, dodge and drift through Fred’s trap-ridden world as he escapes Grimmy Reaper. – Compete and help your friends! – Customize and gear up your character! – The best Fred Game ever! – Async multiplayer mode. Race against your friends! Skiing Fred is an over-the-top action-sports game featuring a unique free-movement system that allows you to take control of the action and perform true skill-based special moves. 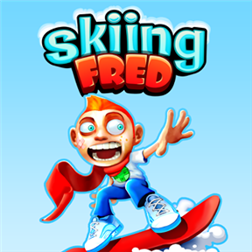 Whether looking to beat a friend’s record, complete missions, unlock achievements o get that particular item set collection, Skiing Fred packs a full load of fun for everyone!